kli » Do You Have Dirty Glasses? Do You Have Dirty Glasses? Like many of you, my morning routine includes getting up early and taking a shower. Besides the obvious cleansing a shower provides, it is also very refreshing! After I get out and dry off, part of my routine is to wash my glasses. I do this so I start the day “able to see” clearly. As I hold them up to the light, it’s amazing to see all the spots, fingerprints, and other mess that has accumulated on the lens. All this after just a single day of use! You know, like my glasses that need (at least) daily cleaning; each one of us accumulates dirt and undesired mess just because we live and operate in a sinful world. The continual bombardment of worldly attitudes and opinions can easily stick to us. The result? The “lens” we see life through can become cloudy and dirty. It is a fact that dirty glasses will hinder and distort light. In time, what we see may not be what is really going on. Please consider this; if our sight continues to accumulate this dirt, we can begin to believe what we see through those dirty glasses instead of the truth. 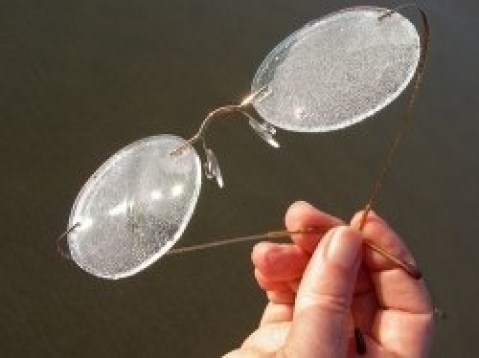 Have you ever worn glasses (or sunglasses) that were dirty or covered in dust? For that matter, have you ever driven your car into the sun when the windshield was dirty? What happened when the bright sun (or when car headlights) were right in your eyes? It’s more than a little difficult to see, isn’t it? In fact, it can be scary! The busy lifestyles we lead can cause us to neglect the daily washing we need by the Word of God. The real “us” is not what we see on the outside. We are spirit, we have a soul, and we live in a body. In order for us to be effective in this world for the Lord Jesus, we must not neglect the care and feeding of the “inward man” who lives on the inside of us. This care and feeding does not come through a cursory 5 minute devotional, but comes with a dedicated life of prayer and study of the Word of God. When we get into the shower, we don’t just let the water wash over us, do we? No, we want to be clean so we actually scrub our bodies! In our study of God’s Word, we need to allow the Word to scrub us the same way. Only with this “scrubbing” does the Word remove those things in us that are contrary to what the Bible says. If the idea of a life of prayer and study of God’s Word is foreign to you, don’t despair. We can help! Kingdom Life Institute (KLI), the training arm of Faith Outreach Center International, is dedicated to providing the focused training you need for a strong Christian walk. Our passion at KLI is not only to provide a solid biblical foundation, but also show each student how to make practical application of God’s Word in daily life. Despite what some say, the Bible is just as relevant today as it was when it was originally penned! Come learn why! KLI Track I classes focus on “Mastering the Basics”. This program of study is for everyone, but especially those who have never attended structured biblical training. Our “in residence” classes are held on Tuesday evenings and run from September through May. We also have a Video School which offers online courses. These courses are perfect for those students who are unable to attend in person, and/or are frequent travelers. The Lord has prepared a tremendous banquet table for you through these courses, so don’t wait another minute! To sign up, click here. You’ll be eternally glad you did!